We’d love your help. 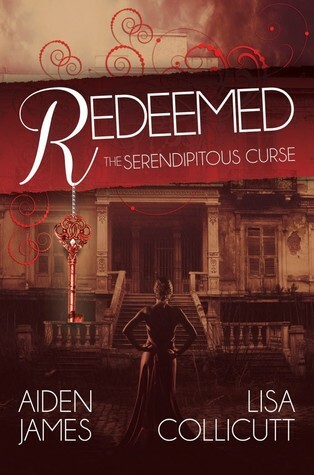 Let us know what’s wrong with this preview of Redeemed by Aiden James. Solomon is on a desperate quest to free his beloved, Desiree, from her frigid prison in the darkest reaches of the Outerworld. Armed with his crystal shard of light, the sliver of black mirror that the witch Madeline Jacobs pulled Desiree through, and the key to a fabled unholy shrine in this world of darkness, Solomon departs modern day Savannah on his final journey. Toget Solomon is on a desperate quest to free his beloved, Desiree, from her frigid prison in the darkest reaches of the Outerworld. Armed with his crystal shard of light, the sliver of black mirror that the witch Madeline Jacobs pulled Desiree through, and the key to a fabled unholy shrine in this world of darkness, Solomon departs modern day Savannah on his final journey. Together, the star-crossed lovers escape Madeline's minions through frozen hells to another world, in some ways even more terrible: Savannah, Georgia during the American Civil War. The locals don’t take kindly to the persimmon-haired beauty, Desiree. Her comely appearance marks her as a witch, and her foolish confidence as a history major runs afoul of the stark reality of the harsh conditions her African-American ancestors faced in slavery. Meanwhile, the demon Amon is determined to take over Solomon’s entire being in order to possess Desiree - a battle Solomon isn't sure he can win. To ask other readers questions about Redeemed, please sign up. Very pleased with this trilogy, so many things happening in each book, it made for quite the exciting and engaging ride! The last book was every bit as good as the first two, I was amazed at how much was still going on in this last book, it was still non-stop, never a dull moment through the whole book. Through any of the books actually. The ending was very satisfying, everything flowed smoothly from the first book to the last book, without any unnecessary fluff and filler. I highly recommend this Very pleased with this trilogy, so many things happening in each book, it made for quite the exciting and engaging ride! The last book was every bit as good as the first two, I was amazed at how much was still going on in this last book, it was still non-stop, never a dull moment through the whole book. Through any of the books actually. I received this book from the publisher, Curiousity Quills Press, for an honest review. I feel a bit at a loss with this book. And I know the reason for that. Unfortunately, I didn't read the first two books before this one. With that in mind, I will continue with the review. I was instantly pulled into what was going on right in the beginning. My guess is that this book literally starts where the previous left off and I'll tell you, it was descriptive and awesome. I liked the vision of the underw I received this book from the publisher, Curiousity Quills Press, for an honest review. I was instantly pulled into what was going on right in the beginning. My guess is that this book literally starts where the previous left off and I'll tell you, it was descriptive and awesome. I liked the vision of the underworld (errr, I mean outerworld). It's cold, but beautiful. I didn't have a problem understanding the characters or the background of the first two books. Which is nice if someone makes the same mistake as I did. I did like the characters in this book. Solomon seemed a truly broken man working his way of redeeming himself and keeping the woman he's fallen in love alive. Though she is a witch, Desiree is the woman that brought him out of his darkest spot. At least, that's how I felt about him. Desiree, on the other hand, is a woman willing to push back expectations and her own safety to be with the man she's fallen for. Even if that means fighting the demon that has a grip on his soul. I'm pretty sure that's how readers of the previous books would describe the two because even in this book, I could see the amount of work the two have to go through to keep their relationship going. I did like the deep South feel of the book and how you are transported to a time where slavery was close to its demise. There was tension when Solomon and Desiree were back in Savannah. There was also the demon, Amon, who I would say is a disturbing, but enjoyable evil character. He has a sick obsession with Desiree and I like it. Aiden James is the bestselling author of Cades Cove, The Judas Chronicles, and Nick Caine Adventures (with J.R. Rain). The author has published over thirty books and resides in Tennessee with his wife, Fiona, and an ornery little dog named Pepper. To learn more about Aiden James and his latest books, look for him on Facebook (Aiden James, Paranormal Adventure Author) and Twitter (@AidenJames3).